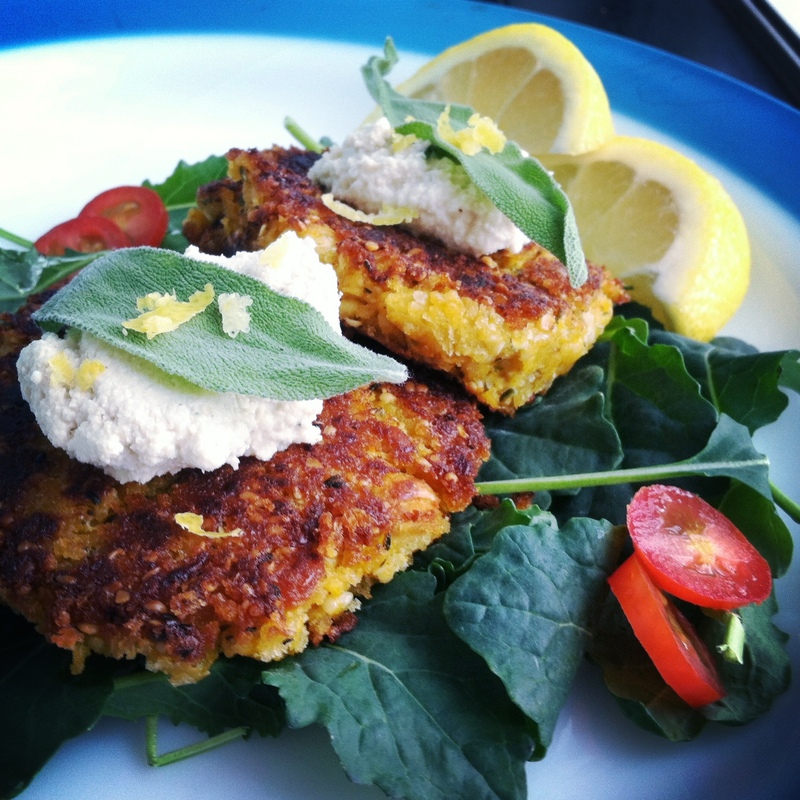 Vegan Pumpkin Chickpea Fritters. | Eat More Plants. I’m having a foodgasm right now (tmi? sorry). But really, I made ridiculously amazing fritters today. So easy and SO good. I might eat them again for dinner lol. I had a can of organic pumpkin purée leftover from some pumpkin muffins I made for thanksgiving and I’d been looking for an interesting recipe to use it for. Finally found one today. The most obvious use would be some bread or muffins or even a soup but I wanted to go in a different direction. So I saw this recipe for fritters and I went for it. Note that you can also make the mix ahead of time without coating in panko, and refrigerate it for later use. Mash the chickpeas with the pumpkin until 75% of the peas are mashed. Add in the vinegar, hemp hearts, garlic and season with salt and pepper to taste. You could add other spices here such as cayenne, cumin or coriander if you wish to change it up a bit. Heat a large non-stick pan on medium heat and cover the bottom of the pan with safflower or good quality olive oil. Measure a golf ball sized amount of mix in your hands and roll to cover in bread crumbs. Press each ball down in the pan to flatten the ball into a patty shape. Carefully turn over after a few minutes checking not to burn but to brown nicely. Let cool (if you can resist), squeeze some lemon, top with cashew cream and devour! I had some cashew cream that I made the other day with lemon, nutritional yeast and thyme. Decided to chop some fresh sage and mix it in as well. The sage is key! I used to think I didn’t like sage but I think I was just pairing it with the wrong flavors. These are a must try! I’m I’m love. Try not to substitute anything in this recipe, just because everything really works perfectly. The vinegar adds the right amount of tang, the hemp hearts add a richness and the lemon adds an acidic note. What you could get away with substituting is the pumpkin. Any other squash would work well here. I might try this with butternut squash next time! You could bake these in the oven if you don’t want to fry. Try for 20 minutes at 350. Lightly grease your baking sheet or use parchment paper to prevent sticking. I found this recipe on this vegan blog. Awesome recipes!